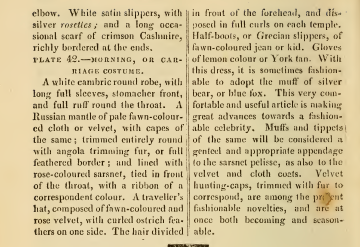 Unlike earlier editions of Ackermann’s, in which the pseudonymous Arbiter Elegantiarum doled out fashion advice as part and parcel of the month’s commentary on its fashion plates, March 1813’s issue includes a separate column devoted to “personal decoration.” It is couched as a letter from a fashionable young lady, Julia, who has taken up abode in Grosvenor-square, and is writing to an unnamed correspondent in the country (an aunt, perhaps?) Did Ackermann realize that young women would be more receptive to fashion advice in the form of up-to-the-minute news from a friendly female rather than as hectoring advice about what should be from an unknown gentleman? 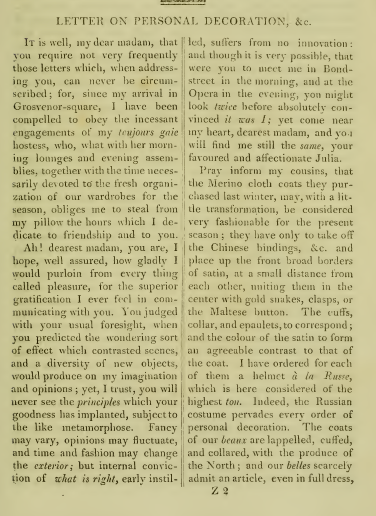 After the opening two paragraphs of polite greetings and assurances of friendship and continuing decorous behavior, Julia begins her discussion of fashion by asking her correspondent to “inform my cousins, that the Merino cloth coats they purchased last winter, may, with a little transformation, be considered very fashionable for the present season.” Today, if someone were told to “transform” her clothing by taking off some ornaments and replacing them with others, one might be forgiven for assuming that she had not the funds to purchase new garments. 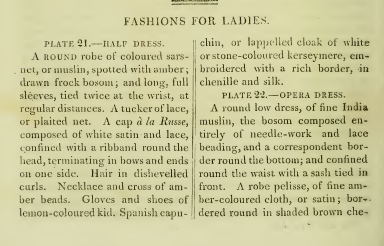 But in the nineteenth century, because the price of many fashionable fabrics was so high, many a well-off lady refashioned her garments to suit current trends. 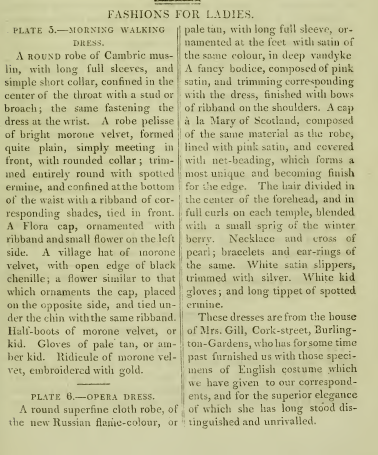 After reading Julia’s letter, do you think you’d know enough to dress yourself to meet 1813’s fashion demands? Earlier this month, I attended a wake for a young Catholic man. As I watched the mourners moving through the room, I noticed that many of the girls and young women wore necklaces with crosses of silver or gold. 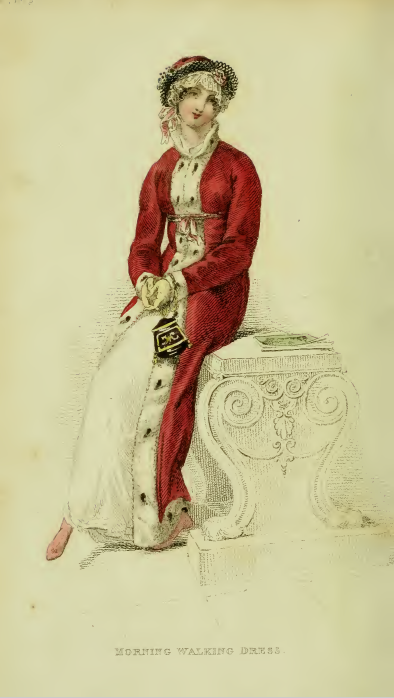 I had always regarded the wearing of such crosses as a particularly Catholic tradition, but this month’s fashion plates reminded me that Protestant women in the Regency period often donned the cross as an adornment, too. 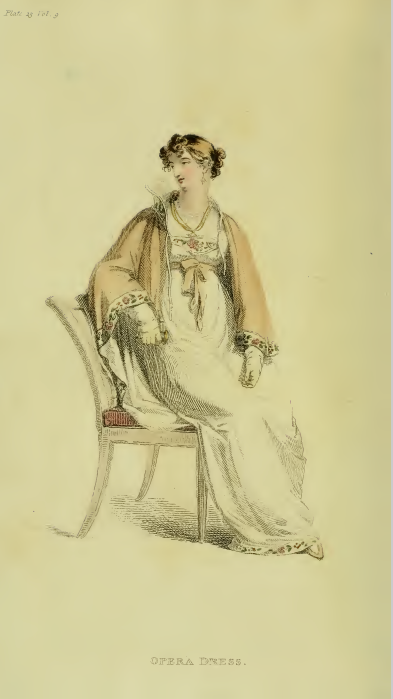 In both of March 1813’s plates, one featuring a Half-Dress, the other an Opera Dress, the ladies wear necklaces with a cross: in Plate 21, of amber beads; in Plate 22, of white satin beads. 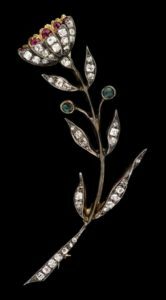 And of course, this reminds me of Jane Austen’s topaz cross, gifted to her by her brother Charles. Was wearing a cross always appropriate, no matter the occasion? 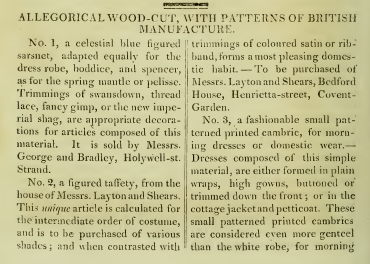 March’s “Patterns of British Manufacture” are all fabrics, three dress materials and one of linen shirting. 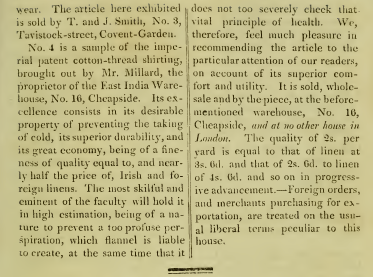 The latter, despite being sold by the “East India Warehouse,” is apparently an English manufacture, for Ackermann declares it “of a quality equal to, and nearly half the price of Irish and foreign linens.” And it “prevents[s] a too profuse perspiration” to boot! “It is sold, wholesale and by the piece, at the beforementioned warehouse, No. 16, Cheapside, and at no other house in London.” Were Regency shoppers drawn by such claims of exclusivity, I wonder? To keep warm in the chilly days of February 1813, ladies are recommended to don cloaks with a military flair. 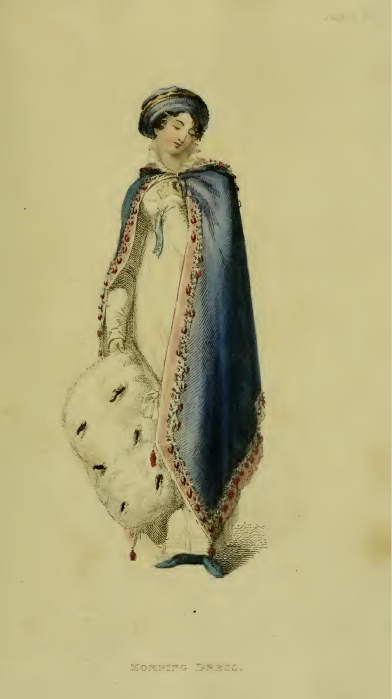 In plate 13, a Cossack cloak, of “pale Russian flame-coloured cloth” covers the fashionable Evening Dress, while a “Prussian hussar cloak, of Sardinian blue velvet” with a “variegated ball fringe” protects the lady from wintry winds during her morning walk. The “Russian flame-coloured cloth” also featured in last month’s fashion plate; I haven’t been able to discover just why this color, which appears in the plates more as a tan than a red, should be labeled “Russian.” Perhaps because during Napoleon’s invasion of Russia in 1812, the cossacks were ordered to burn the villages, towns and crops as they retreated, so that the French would not be able to live off the land they were invading? 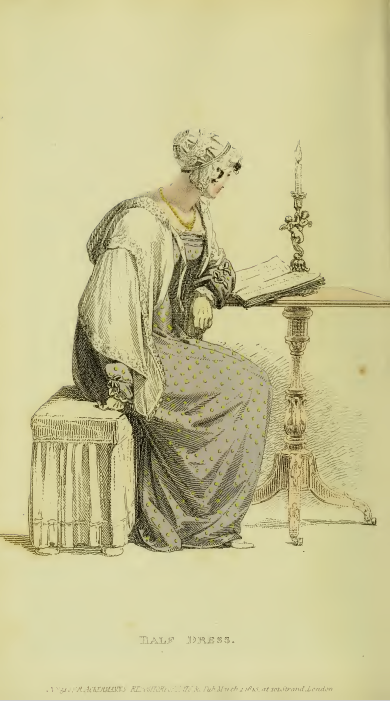 The oversized muff in Plate 14, a Promenade or Walking costume, is made of spotted ermine, a trim used in both of last month’s (January 1813’s) plates. The spots look amazingly regular, and very large, almost as if they were trimmings added on to a plain white ermine background. It does look amazingly warm, though, doesn’t it? 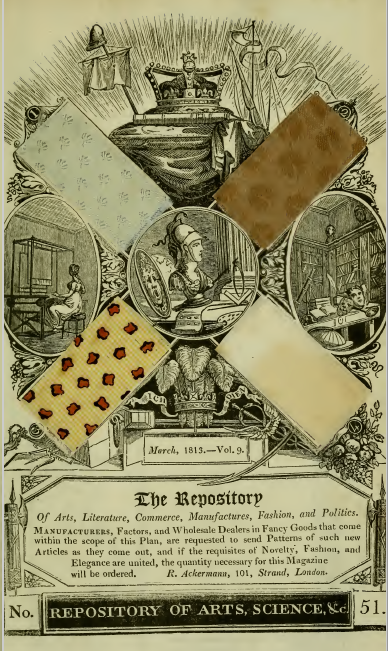 This month’s “Patterns of British Manufacture” includes both fabric and paper samples. 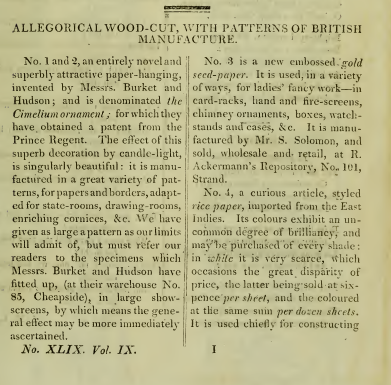 Just look at #4, a “most beautiful gold embossed striped paper, designed for almost every order of paper-work.” It appears decidedly modern, does it not? I wonder how much Ackermann’s sold it for? 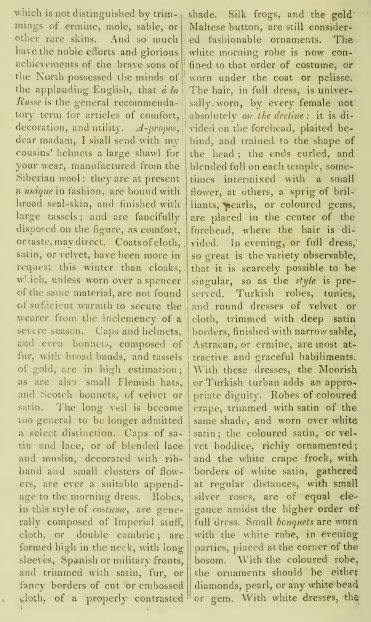 I’m always taken by the color words from the Regency period. 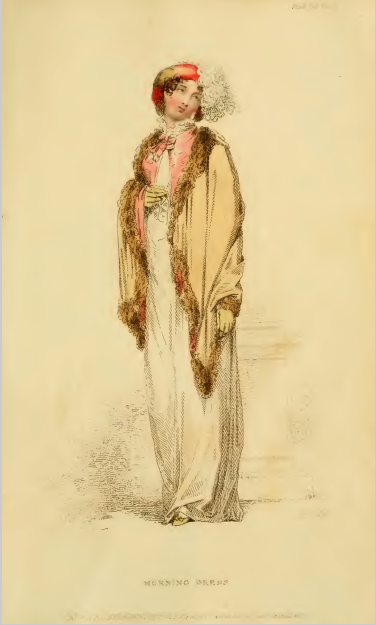 “Morone” is the color for January 1813, used to describe the “Morning Walking Dress” in Plate 5. As one might surmise from the print, “morone” is a (now obsolete) variant of maroon, a “deep crimson colour,” according to the OED. In a citation from 1836, the shade is described as “the colour of the unripe mulberry.” When trimmed with spotted ermine, as the robe pelisse in this plate is, it makes me think of all those costume robes for kings that we used to dress up in as children. Do you think the combination had the same connotation of royalty for Regency fashionistas? Both dresses are credited to one Mrs. Gill, Cork-street, Burlington-Gardens; for “the superior elegance” of her dresses she “has long stood distinguished and unrivalled.” A decidedly English name, Mrs. Gill. 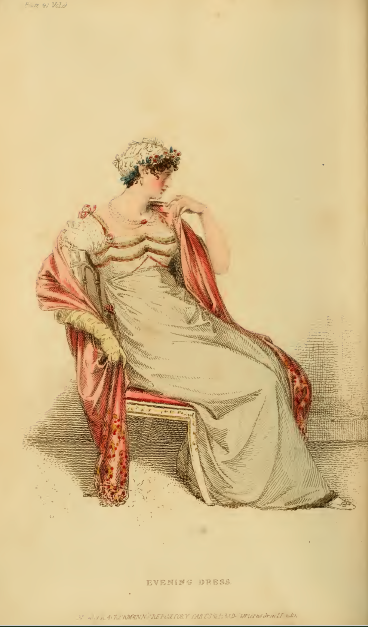 Perhaps all the Regency novels that portray the most sought-after dressmakers as French (or as pretending to be so) do not have it quite right? 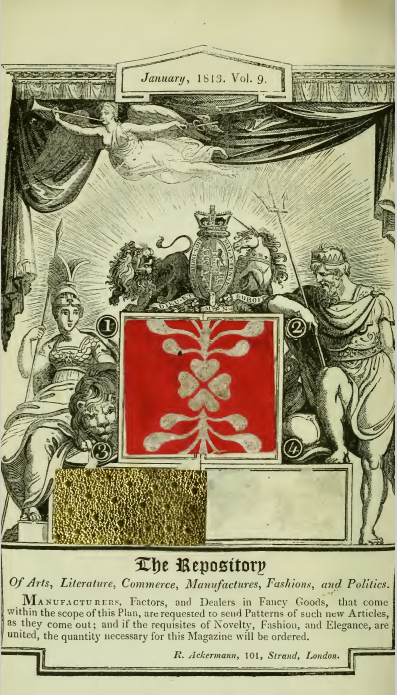 This month’s “Patterns of British Manufacture” are not fabrics, but rather decorative papers. 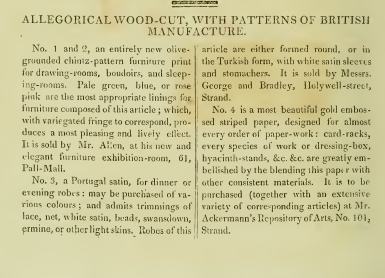 The sample is difficult to see, but #4 is rice paper, “imported from the East Indies.” The OED gives 1810 as the earliest mention of “rice paper” in English, so its appearance in Ackermann’s Repository (and at Ackermann’s shop) illustrates how up to the minute the magazine was in bringing innovative goods to the attention of its fashionable readers. 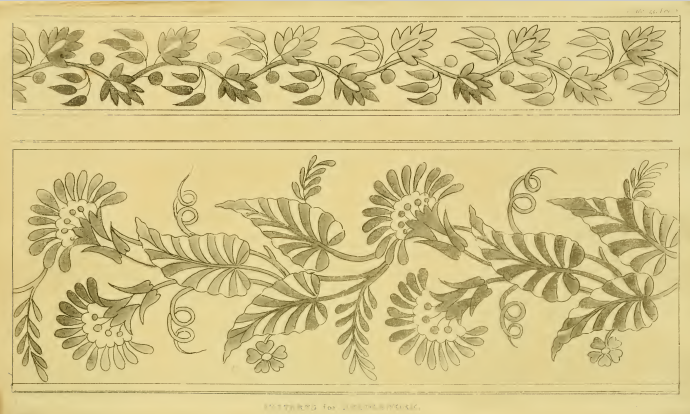 The paper, which comes in multiple colors, is recommended for fashioning paper flowers, which will “possess a superior degree of delicacy, and a nearer approach to nature” when constructed from such thin, translucent paper. 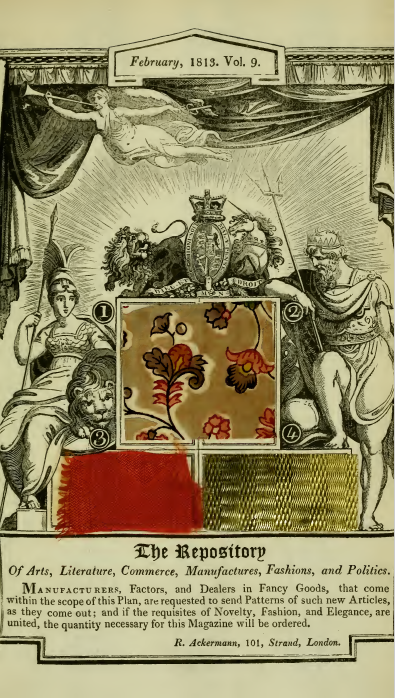 After a bit of a hiatus, to concentrate on the publication of A Lady without a Lord, I’m back with the latest installment of the great Ackermann’s fashion print project! A Regency evening gown with pockets? 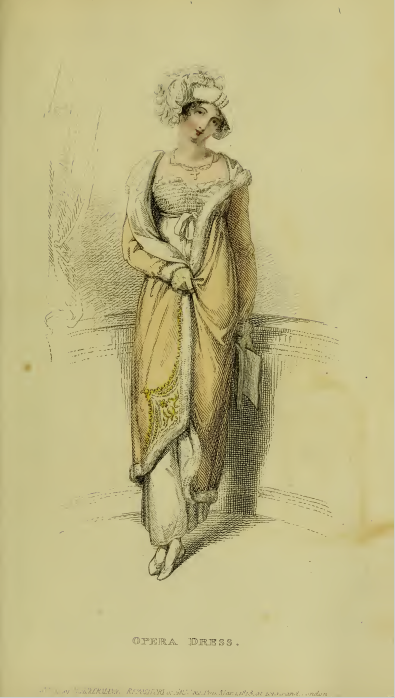 I’d never imagined a fancy ball gown would ever contain a pocket, but December 1812’s issue of Ackermann’s proves me wrong. 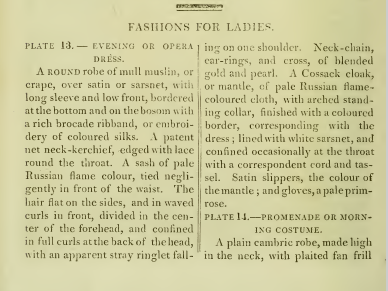 Not only does the Evening Dress in Plate 41 contain pockets, said pockets are even ornamented with crimson and gold bows! I would have thought a bow on a pocket would ruin the effect of the long line of the Regency dress. Would you adorn your gown with a pocket ornament, if you were wearing such a dress? 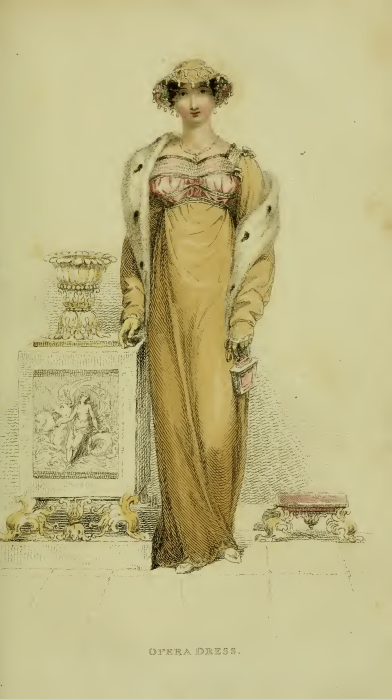 In addition to the description of the Morning or Carriage Costume in Plate 42, Ackermann’s columnist reports that “it is sometimes fashionable to adopt the muff of silver bear, or blue fox,” which is “making great advances towards a fashionable celebrity.” Muffs and tippets of the same fur are also recommended, as are “velvet hunting caps, trimmed with fur.” Does the “silver bear” refer to the now-extinct Mexican grizzly bear, I wonder? And what species is the “blue fox”? An Arctic or Siberian fox? The lady in the print has a cape trimmed with “Angola trimming fur”—from the Angola Colobus monkey? Did adorning themselves with exotic furs make Regency-era women curious about the distant countries from which they came, do you think? Or the fauna native to them? This month’s issue includes no fabric samples, only an elaborate pattern for needlework. To decorate a waistcoat or the hem of a ball gown? Those flowers look quite modern to me!